“It will be interesting to see how this new chapter in our life manifests itself musically. I’ve always made music that was representative of real life. Life doesn’t get more real than. . .
Eric Church is well known for his singing, his songwriting and most recently his GRAMMY nominated third album “Chief”. He’s picked and penned many a solo tune and many a collaboration. Many of which many are familiar with. But in 2011 amidst his rising success, his release of “Chief” and his relentless touring, Eric collaborated with a beautiful young woman and created a masterpiece whose story’s just begun. Eric Church and his beautiful wife Katherine share their collaboration with the public for the first time. Boone McCoy Church, born on Oct. 3, 2011 at 7 lbs / 11 oz meets the world for the first time at 10-weeks old. 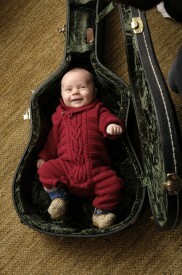 A very healthy and happy boy indeed looking up from the casing of his daddy’s 6-string guitar. And according to Eric, the most amazing gift he’s ever received. Mom and dad will be celebrating their son’s first Christmas at home with family. Country Music Pride would like to extend a big WELCOME to Boone and a big thank you to Eric and Katherine for sharing your most precious and personal gift with us. May you have a wonderful “First Christmas as parents” with many more to follow. And fans can follow Eric’s headlining tour, The Blood, Sweat & Beers Tour, beginning in 2012 on January 19th in Fort Smith, AR.